An excellent sale of 1,161 sheep on Tuesday with lambs selling to a top price of £91 and a top of £3.89 per kg. 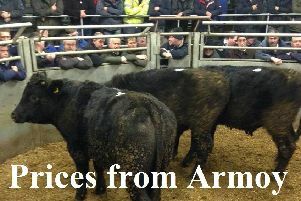 LAMBS - Ballynahinch producer, 15, 25.75kgs, £91, Millisle producer, 12, 27kgs, £90, Lisburn producer, 3, 26kgs, £90, Crossgar producer, 6, 25.5kgs, £88, Dromore producer, 4, 25kgs, £88, Killinchy producer, 32, 24kgs, £88, Saintfield producer, 16, 24kgs, £87.50, Downpatrick producer, 14, 25kgs, £87.50, Dromara producer, 26, 23.75kgs, £87, Dromara producer, 16, 24.75kgs, £87, Newtownards producer, 5, 25kgs, £87, Moneyreagh producer, 11, 25kgs, £86.50, Ballywalter producer, 14, 25kgs, £86, Castlewellan producer, 5, 25kgs, £86, Ballynahinch producer, 12, 23.5kgs, £86, Ballynahinch producer, 18, 22.5kgs, £85.50, Cloughey producer, 18, 22kgs, £85.50, Castlewellan producer, 16, 23kgs, £85.20, Downpatrick producer, 7, 22.5kgs, £85.20, Ballygowan producer, 23, 23.75kgs, £85, Killinchy producer, 20, 23kgs, £85, Ballynahinch producer, 12, 24kgs, £84, Castewellan producer, 8, 24kgs, £84, Castlewellan producer, 4, 24kgs, £84, 7, 21.5kgs, £79, Newtownards producer, 5, 24kgs, £84, Carrowdore producer, 14, 22kgs, £84, Ballynahinch producer, 2, 23.75kgs, £84, Lisburn producer, 25kgs, £84, Downpatrick producer, 8, 22kgs, £83.50, Carrowdore producer, 41, 23kgs, £83, Moneyreagh producer, 8, 23kgs, £82.20, Lisburn producer, 3, 23kgs, £83, Comber producer, 30, 23kgs, £83, Dromore producer, 7, 21.5kgs, £81, Ballynahinch producer, 28, 22kgs, £81, Hillsborough producer, 6, 22kgs, £80, Crossgar producer, 14, 22kgs, £80, Saintfield producer, 10, 21.75kgs, £79.20, Downpatrick producer, 12, 21kgs, £78, Comber producer, 7, 22kgs, £78, Ballywalter producer, 8, 21.5kgs, £77.80 and Newry producer, 14, 21kgs, £77.20. FAT EWES - Comber producer, £90, Castlewellan producer, £85, £70, Newry producer, £83, Lisburn producer, £83, Crossgar producer, £82, £70, Millisle producer, £80, Killinchy producer, £77, Killinchy producer, £75, Ballynahinch producer, £75, Saintfield producer, £72, Ballyhalbert producer, £72, Hillsborough producer, £70, Lisburn producer, £70, Carrowdore producer, £70, Portaferry producer, £68 and Killinchy producer, £68.